Shrink-wrapping involves covering the boat with a plastic film that is strapped in place and then shrunk with a propane heater. You can have your yard or a shrink-wrap firm do the job for you or do it yourself with a shrink-wrap kit that&apos;s available at most marine stores and contains the film, propane heater, and even a how-to video. Often, several boaters will buy one kit and extra film to reduce costs. Before shrink-wrapping begins, you&apos;ll need to pad all sharp corners with some carpet scraps or foam. Lower all folding antennas, and place a length of PVC pipe over them to prevent the shrink-wrap film from bonding to them. 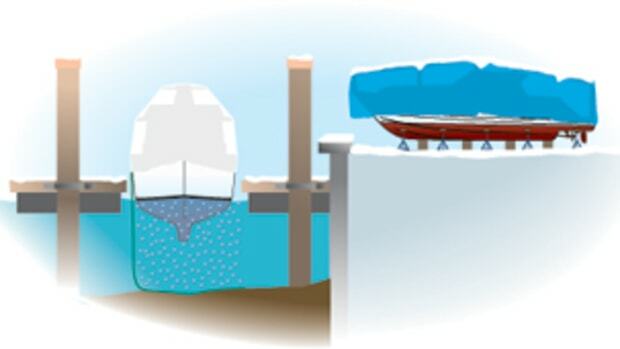 Large cockpits or other open areas may require a support to prevent low spots where snow, ice, and water can accumulate. You&apos;ll also need to add a few vents after the wrap is in place to prevent mildew and condensation. Finally, you can add a zippered door if you want access to the boat&apos;s interior.